What Works successfully executes the 3rd season of the hit TV series OMG! Chhattisgarh on HISTORY TV18, featuring host Paras Tomar. The team at What Works were given the opportunity to make the show their own, and bring freshness to an already ongoing series which has seen 2 seasons till date. The show brings to life, some extraordinary stories of places and people from the state of Chhattisgarh. The series is an ongoing collaboration between HISTORY TV18 and the Govt. 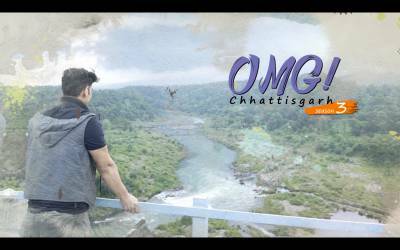 of Chhattisgarh, who are looking to showcase the best the state has to offer to the rest of the country. It is the first project for What Works with HISTORY TV18 who trusted the agency to develop and execute one of its flagship properties with a fresh perspective and a newfangled approach. The shoot took place over a course of 13 days in Chhattisgarh, covering cities, towns and villages of the beautiful state and it’s diverse people. There are a total of 12 stories spread over 3 episodes. Some of the most interesting stories of the lot were the new internet sensation “India’s Rihanna - Renee Kujur”, “The Queen of Storytelling Teejan Bai” and the ‘Rajnandgaon Hockey City” along with several others that depict the diversity and variety in the culture of Chhattisgarh. What Works has worked on intriguing projects in the past which includes the popular web series ‘The Trip’ ft. Lisa Haydon, Mallika Dua, Shweta Tripathi and Sapna Pabbi. They’ve also conceptualized and executed impactful campaigns like ‘Sui Dhaaga Logo Reveal’ for Yash Raj Films, ‘Har Gully Mein Dhoni’ for the biopic of Indian Cricketer, M.S Dhoni, the official campaign for MAMI Mumbai Film Festival, co-branded films for the movie Raees in collaboration with UBER and the in-theatre promotional videos for Jagga Jasoos. In advertising, the company has created popular TVCs and brand films for KFC, Flipkart and Samsung. What Works is also the Content Agency for Kolkata Knight Riders, Anushka Sharma’s fashion brand NUSH and also for Fox Star Studios. Currently, the agency is presently working with Vishal Bhardwaj on promoting his upcoming film ‘Pataakha’ with content that creates an impact on the viewers. “It was a great experience to work with What Works. Their varied experience has brought a breath of fresh air this season.” says, Sangeetha Aiyer, Head - Marketing & Digital Initiatives at A+E Networks I TV18. “We always wanted to work with History TV18 and were delighted when we finally got the opportunity. OMG! Chhattisgarh already had 2 seasons before this one, so our job was to depict the stories without the hangover of previous 2 seasons. We were taken aback by the diversity that Chhattisgarh had to offer and our team, including the host Paras Tomar, fell in love with the people of this beautiful state. We’re extremely happy with how the show has turned out and are excited to show Chhattisgarh in a way it has never been seen before” says, Imran Shamsi, Founder, What Works. Investigate some of the greatest mysteries with HISTORY TV18’s ‘Breaking Mysterious’! It's Truck VS Terrain on HISTORY TV18’s Monster Motor Challenge!